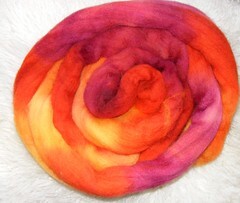 I've dyed up some mid-grey Shetland this year, and it's come up fabulously rich in colour, and remarkably soft as a fibre. I do prefer the 'traditional' breeds as fibre; although I know most people seem to prefer merino, especially for felting, I find there's so much more character and versatility in Shetland and Bluefaced Leicester, to use examples that I can get hold of easily. 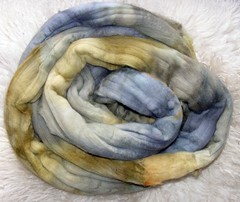 And of course, they come in natural colours too, which I love to overdye. The one above is Twilight, the one below is Blue. 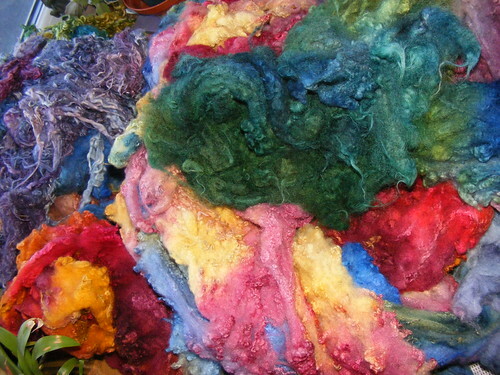 I've done lots of fleece this year, trawling nice fleeces out of the stash, ones I've had a while and not used yet, and dyed them in fabulous and mostly saturated colours. 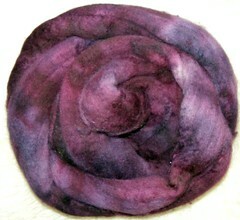 Last year I bagged dyed fleece up and they went very well, so let's hope the same happens this year. I've also done some alpaca fleece, but I think I'll have to fluff it up a bit before packing - it feels fabulous but looks a bit heavy. All the wool is taking ages to dry, much longer than the tops. 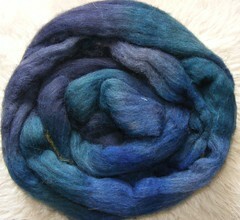 I have a small bump of white Bluefaced Leicester to do this week, plus lots of sock yarn. I want to be finished at the end of this weekend coming, so that'll leave me with a week to make sure I'm all packed and organised and labelled. Pricing may happen at the unpacking and setting up end.